When people think of Mardi Gras, the celebrations in New Orleans and Rio de Janeiro often come to mind. I have been to Mardi Gras in New Orleans once and I can only describe this raucous revelry as an opportunity for people to do things that would be illegal in their hometowns. I saw more drunken debauchery and exposed male and female anatomy during my three days in New Orleans than I had seen in my entire life! Many people don’t realize that there are many other Mardi Gras celebrations outside of New Orleans. This year, I went off the beaten path and experienced Mardi Gras in Lake Charles, Louisiana. 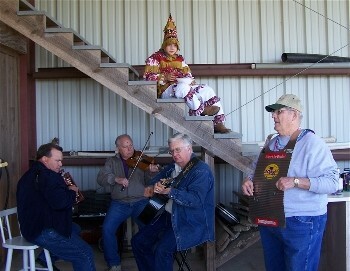 Mardi Gras observances in Southwest Louisiana are more traditional and geared towards families. The blatant public drunkenness and bearing of body parts is not permitted, so if that’s your thing, read no further. Also known as “fat Tuesday,” this pre-Lenten festival is marked by spectacular parades featuring floats, pageants, elaborate costumes, masked balls and lots of beads. In a strict sense, Mardi Gras is a time of preparation immediately before Ash Wednesday and the start of the fast of Lent. Mardi Gras is thus the last opportunity for merriment and indulgence in eating and drinking. And eat and drink I did, food and drinks were plentiful as I made my way from event to event throughout Southwest Louisiana. 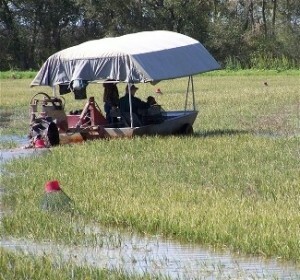 My first stop was Jennings, a friendly community with Cajun roots. I began my Mardi Gras experience with a tour of the Tietje Crawfish Farm, followed by a traditional crawfish boil at the Tietje Barn. It was here that I first experienced the more rural traditions of Mardi Gras. Families and friends of all ages gather together for food, drink, live music and dancing. An impromptu band played Cajun music on a squeezebox, washboard and fiddle while children, dressed in their Mardi Gras costumes, danced. It was also here that I sampled my first crawfish. There’s not much to eat in these 2 or 3 inch creatures and it takes some time to learn how to get the meat out. However, the peeling ritual is pretty simple. Just break the crawfish in half and toss the head, then pinch the tail and pull out a morsel of sweet meat, then repeat many times. In Cajun country, a three-pound plate of boiled crawfish is considered an appetizer. From Jennings I moved on to the city of Lake Charles. With over 50 krewes, or groups representing all parts of the community, Lake Charles boasts the second largest Mardi Gras celebration in the state. The Mardi Gras season traditionally begins on the Twelfth Night or Epiphany, celebrating the arrival of the three kings bearing gifts for the Christ child. During the season, many of the various krewes host lavish private balls. 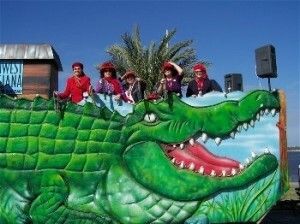 The public festivities kick into high gear the Friday before Mardi Gras with a series of parades, and events. 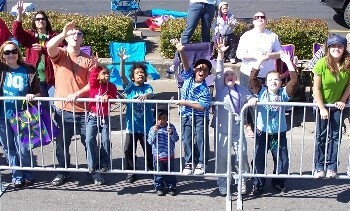 Friday is the Merchant’s Parade, where local businesses take to the streets in cars and floats. Saturday is the Krewe of Omega Parade and the Barkus Parade, a whimsical parade of costumed pets and their owners. Sunday is the Children’s Parade and the lighted Boat Parade in the evening. Fat Tuesday begins with the Red Hat Parade, followed by the Past Krewe Royalty Parade and peaks with the dazzling Krewe of Krewes’ Parade. A trip to Lake Charles is not complete without a visit to the Mardi Gras Museum. Open year-round, the museum features the largest costume display in the south with hundreds of the most ornate and flamboyant costumes imaginable. 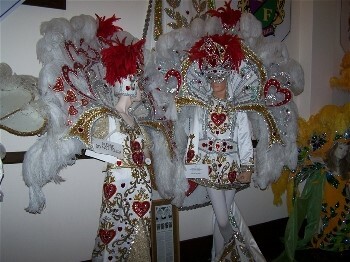 The museum also includes an exhibit on the history of the festival, a costume design exhibit and a Mardi Gras parade display, including a parade float that everyone can climb aboard. All costumes on display are the authentic costumes worn by past krewes. 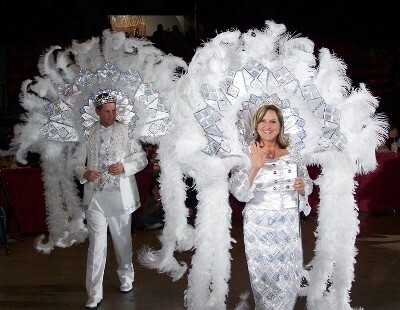 Even though many of the exhibits had a photograph of the original krewe member wearing the costume, I still found myself imaging what it would be like to actually see someone wearing one. My wish was granted that night at the spectacular Royal Gala. The Royal Gala, which occurs the Monday night before Mardi Gras is open to the public to enjoy and view the costumes. This Cinderella like ball features the season’s full courts of 50 krewes with kings, queens, royal dukes and duchesses, captains, courtesans and jesters followed by a night of music and dancing. Amidst music, lights and glamour, one by one, each krewe parades down the runway of the Lake Charles Civic Center in their finery. The exquisite details of the costumes give new meaning to the word extravagant. Some of these costumes weigh up to fifty pounds and cost well over $15,000. Due to the time and money commitment, most people are only in the royalty once in a lifetime. Tuesday marked both the highlight and the culmination of the events. I had the opportunity to ride a float in the Red Hat Parade. With the boom box blasting out a zydeco tune, I grabbed a handful of colorful beads and continued the tradition of throwing of beads. Everywhere I looked were crowds of people with their hands up shouting “Throw me something, Mister, or in my case, Sister!” As I threw out the beads, I quickly learned that there seemed to be a relationship that developed: first make eye contact with an individual, and then fling the beads so they land in their hands. 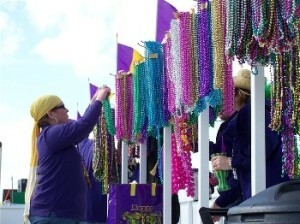 I was amazed by how many people smiled and thanked me for the beads. It was a ton of fun and over far too soon. Following the Red Hat Parade, I joined a block party along the parade route for the main event, the Krewe of Krewes Parade. I was told that the 4-mile parade route was the “world’s largest tailgate party.” All along the route, groups of people set up tents and spent the day barbequing and watching the parades. This time, I managed to be on the receiving end of the bead toss, when I gathered about thirty necklaces thrown from various floats. I now have a strand of beads hanging from my car’s rearview mirror to remind me of my time at Mardi Gras, another longstanding Louisiana tradition.